If you’re in the market for an Exhaust Tube Bender, you would be wise to check out our Exhaust Pipe Benders by BendPak. 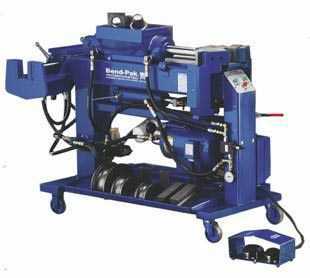 What makes BendPak pipe benders so good? To start with, only quality components go into every bender. They don’t take any shortcuts. They’ve been at it for over three decades, so they should know what they’re doing. They offer manual models, along with semi automatic and fully automatic benders that provide extreme machining precision. They can handle up to 180 degree bends. They don’t just bend, they expand and flare pipe too. They come with a standard die package that handles up to 2.5 inch pipe. If you want to handle three inch pipe, you’ll need to get the optional 3 inch die package. All BendPak benders features their exclusive clampless swager which puts out a force of 30,000 lbs. of force. Their unique internal segment expander can be used for I.D. expansions, O.D. expansions, slip-fits, flares, ball-joints and manifold flanges. Their Blue-Bullet is equipped with a double-ended cylinder for both the clampless swager and segment expander. A single control handle operates the cylinder and is placed towards the middle, so you can comfortably stand in one location and operate both sides. BendPak also has their twist lock tooling and bending dies to maximize productivity. They top it off with their generous limited two year warranty. Check them out on our web site and give us a call with any questions.